Pakistan's Victories Over the Taliban: Will They Last? No one has contributed to Pakistan's slide into chaos over recent years more than Baitullah Mehsud. From his base in the wilds of South Waziristan, the leader of the Pakistan Taliban has overseen the killing of more than 1,200 civilians and several hundred soldiers through brutal means, including suicide bombings, kidnappings and beheadings. He has been accused of masterminding the assassination of former Prime Minister Benazir Bhutto in late December 2007. In late March, Washington announced a $5 million reward for information leading to his capture, describing Mehsud as a "key al-Qaeda facilitator." And over the past week alone, he claimed responsibility for five separate terrorist attacks, including the bombing of a luxury hotel in Peshawar and the killing of a vocal anti-Taliban cleric in Lahore. Now Pakistan is taking the fight to Mehsud's mountainous stronghold, ordering an expansion of its current offensive against Taliban fighters in the Swat valley. On Sunday night, denouncing Mehsud as "the root cause of all evils," Owais Ghani, the governor of the North-West Frontier Province, said the government has called on the army to launch a "full-fledged" military operation to eliminate Mehsud and his estimated 20,000 men. The crucial battle may prove to be the most difficult that Pakistan's military has faced on its soil in recent years. Islamabad's decision to launch the offensive against Mehsud signals a deepening of Pakistani resolve against the militants. The army has targeted the Taliban leader on three separate occasions  in 2004, 2005 and 2008  but walked away each time after signing ruinous "peace deals" that have only served to embolden Mehsud. But the military appears more determined this time. It also enjoys the backing of a government that has gained public support as the recent wave of terrorist attacks has heightened revulsion against the Taliban. Military analysts say that the fighting in South Waziristan will not be easy and that the government must be prepared to handle the potential fallout. The harsh, rugged terrain has found much favor with hardened guerrillas. 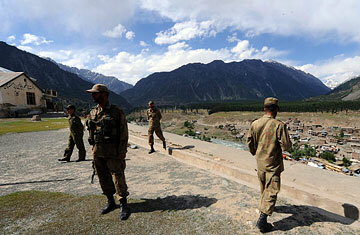 "It will be more difficult [than the Swat-valley operation]," says Hasan Askari-Rizvi, a military analyst. "The Taliban are more deeply entrenched, and they are going to put up a fight. They will avoid head-on battles but will try to harass the army by other means, including ambushes." There is also the possibility that Mehsud's ranks have been fortified by some of the fighters who have fled the conflict in the Swat valley. South Waziristan is also home to assorted foreign militant groups, including Arab and Central Asian fighters. It has long been rumored to be a hiding place of Osama bin Laden. It also remains to be seen how well Pakistan's military will be able to sustain simultaneous fighting on two fronts. While it has claimed a flurry of successes in the Swat valley and two neighboring districts, a decisive victory has not taken place. Maulana Fazlullah, the leader of the Swat Taliban, and other members of his leadership have not been eliminated  a declared priority. Last year, when fighting intensified against militants in the Bajaur tribal agency, the military's campaign faltered in Swat. And over recent months, as the focus reverted to Swat, a failure to consolidate gains in Bajaur has led to a truce there breaking down and Taliban fighters returning. The advantage during this fight may come, however, from abroad. In contrast to the previous offensives in South Waziristan, there are signs of closer cooperation between Islamabad and Washington. Just hours before Ghani's Sunday announcement, a CIA-operated drone fired missiles near Makeen, Mehsud's hometown. Five suspected militants were killed. It was the 20th such strike this year. Since February, the U.S. has stepped up attacks on Mehsud and his allies, broadening its range of drone targets across the tribal belt. The day before the drone strike, Pakistani air-force jets were pounding the same area in retaliation for the recent terrorist attacks in the northwest and Lahore. "Pakistan and the U.S. and NATO troops will have to cooperate with each other," says Askari-Rizvi. "If the army goes in with full force, some of the militants will definitely cross over to Afghanistan." Troops positioned across the border in Afghanistan could squeeze the retreating militants. "There is a need for both sides to closely monitor the border to see where the crossings are taking place." The Pakistan military may also call on rival warlords to harry Mehsud from within his territory. In recent days, Qari Zainuddin, a member of the Mehsud tribe, has spoken out strongly against his fellow clansman, denouncing Mehsud's brutality and vowing revenge for the murder of his relatives. Zainuddin and another group, led by Turkistan Bhittani, enjoy the covert backing of Pakistan's security services. "In the past, these guys were afraid to confront Baitullah Mehsud, because there was no one there to protect them," says Askari-Rizvi. The army could now provide that support as the government uses political means to divide subtribes aligned to Mehsud. Faced with an all-out assault, Mehsud is likely to take the fight beyond the tribal areas and mount perhaps even deadlier bomb attacks in Pakistan's heartlands. "They will try to paralyze the country by striking at the major cities and business hubs," says Khadim Hussain of the Aryana Institute, a research organization that focuses on the problem of militancy in the northwest. "The political government has to be aware of the potential fallout and be prepared for it." Hussain also says the fighting could lead to a further 1.5 million people being displaced, in addition to the nearly 3 million who already have been. But other observers put the number lower, at around half a million, given that many residents of Waziristan have already fled as word of a looming military operation spread in recent weeks.